this new blog series is brought to you by years of trial and error in shoe shopping. we can all relate, right? it's really a jungle out there when it comes to figuring out which shoes are winners, and which ones are like a bad relationship – painful, bad for you, and yet you keep trying to make it work for far longer than you should. 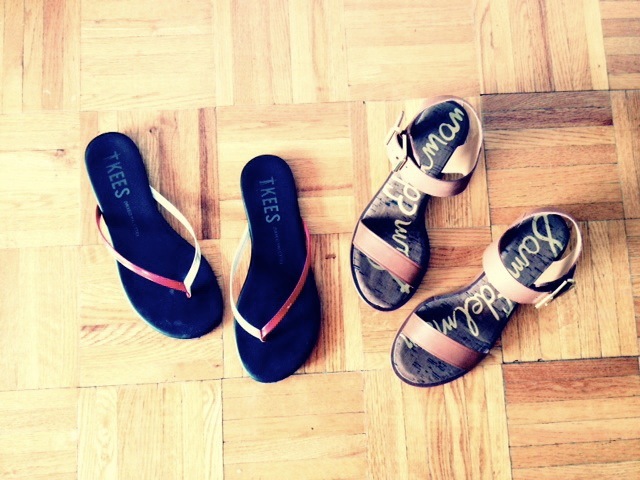 last summer, after my Havaianas broke, i got a pair of Tkees. (FYI - order up if you're a half-size; i'm a 6.5 and the 7/38s are perfect.) almost a year later, they still look new and are as comfy as ever (no breaking-in required!). if i lived in southern California, i'd probably wear these everywhere in the summer. for the less beachy East Coast urbanite, they're perfect as the go-to pedicure shoes, travel/vacation flip-flops, for neighborhood putzing/errand-running, and most importantly, portable back-ups for the workweek or a night out (keep the dustbag and use it to stash these in your bag). i did a detailed review on the Sam Edelmans last month, and i've been wearing mine everywhere. i don't usually buy in multiples, but these are so good that i got them in a few more colors. they're the sandal version of my stash of white tees! what do you think? what are your essential spring/summer sandals? My ultimate beach flip-flops are by Sanuk... they are soooo comfy because they're made out of yoga mats though not as chic looking as those Tkees. I really only wear them at the beach or for pedicures though! Most other flip-flops rub and annoy me - especially those Havaianas. I never understood why people said they were comfortable! yours must be super cushiony! i only wear havaianas at home as house shoes. a rubber flip-flop just feels too college dorm for outside! haha - seriously, i hope someone from the SE team is listening - please make them in black leather again!! k jacques sandals! they are not cheap but they are really well made, and will last a long time if you get protective soles put on the bottom. i've had one pair for 5 years and they are still in great shape! i've followed KJ's designs but am put off by the price and have read mixed reviews about their comfort. i spend much less on my warm-weather shoes. the SE sandals with their cushioned insole really surpasses my more expensive sandals in comfort! I love K. Jacques along with my Rondinis and handmade Greek sandals. I've been wearing K. Jacques since I was a child and have several pairs that were custom made for me in France and a few that I purchased at Bergdorfs. I've always found them to be comfortable and that they mold to your feet. That being said they simply are an incredibly narrow shoe (which means I'm in heaven) and the straps are made for a fairly small ankle. Perhaps that might be the source of the discomfort for some. I love both of your choices and can't wait to try the Trinas. indeed! i think my feet are normal but slightly on the narrower side. Lindsay, the SEs are definitely designed with for a somewhat narrower foot! I agree on the Trinas - some women find them too narrow in the front, but they actually fit my somewhat narrow feet perfectly and have enough room for my rather long toes. My favourite pair of sandals are actually from a store based in Australia and NZ (and who don't ship overseas, unfortunately, now that I've left Australia) that specialises in orthotic shoes and whose main target demographic age is surely 55+! They make some truly ugly shoes but maybe a quarter of the collection each season is actually really modern and kind of awesome (they had a pair of brogues once and the leather had a cut-out pattern that made it look like elaborately woven wicker), and of course all their shoes are also ridiculously comfortable. I have a pair of bright red sandals from them that are more than 2 years old now and are still in excellent condition, so I hope they will be more go-to summer sandals for many summers to come. jess - that totally does not surprise me - there are a number of old school brands that make great product, cool factor or not. I'm still in limbo when it comes to summer shoes, relying heavily on a pair of roman sandal style shoes from Topshop which don't have a lot of support, and a couple pairs of loafers, without anything in between. I'm thinking that I'll probably be keeping an eye out for something once the NH summer sales begin, will be my best bet to nab a bargain! My cydwoq from years ago are still going strong, although last year I finally took it to the cobbler to have the soles fixed. I'm fan of havaianas but I generally don't wear them unless I'm going to the beach or just headed for a yoga class. I love flat sandals and generally just buy any decent-quality pair that catches my eye and wear them until they need replacing. Since I don't wear them daily, one pair feels more than enough. My first two pairs were from Gap and Zara and each lasted about 4 years. My second and current pair are from Massimo Dutti and are about two years old. As a result, I've not felt the urge to spend on an especially pricey pair since the quality of all my inexpensive sandals are fairly satisfactory. I love the cushioning of the Trinas and wonder if it's the same for their flat sandals - if so, my next pair of simple flat sandals might come from there! Hopefully my next pair is ethically-sourced too...with all the news at the moment I've rather soured on fast fashion.